Law enforcers have detained a woman who systematically steals in cemeteries. Since the beginning of the year to the police to complain about the theft turned five victims. In two cases, the crimes were uncovered. Vandalism at cemeteries, mainly engaged in the homeless, sometimes teenagers. They steal everything - from the non-ferrous metals up wreaths and flowers. Female detainees are systematically stealing from cemeteries artificial flowers and wreaths, then to the market to sell. 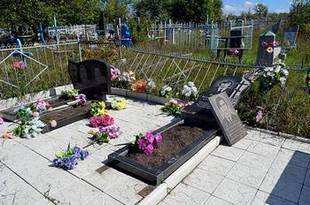 In order to protect the graves of deceased relatives thieves have resorted to all sorts of tricks. That fresh wreaths deliberately poured paint or bouquets little damage. But most relatives of the deceased is brought to despair, vandals who destroy monuments, gravestones, metal fencing. All broken and cut down they pass for nothing in the scrap metal items, which, like mushrooms after the rain, there are around cemeteries.